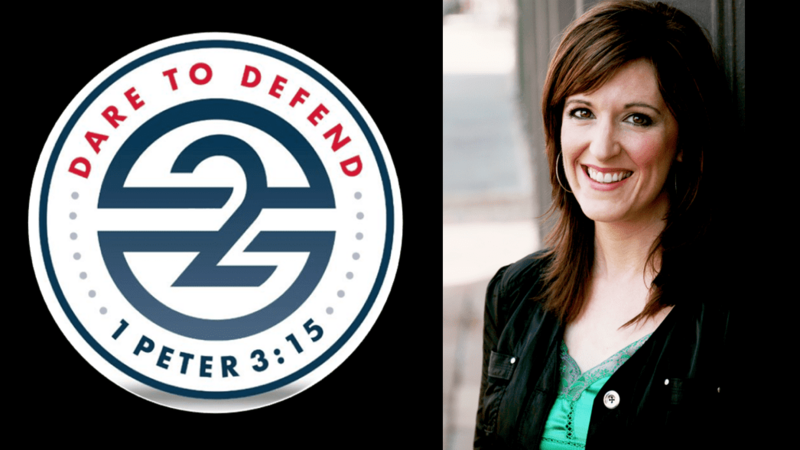 On April 28th and 29th, New York Apologetics will be hosting the D2D Conference that will feature MaryJo Sharp as one of its speakers. Mary Jo Sharp is an aspiring author and Christian apologist. She is a certified apologetics instructor with the North American Mission Board (Southern Baptist Convention). Mary Jo holds a M.A. in Christian apologetics with honors from Biola University (May 2008) and holds a Bachelor’s Degree in Music Education with distinction from the University of Oklahoma. Mary Jo grew up in the metropolitan area of Portland, Oregon. Since her sophomore year of high school, she was determined to become a nationally renowned director of bands either at the high school or collegiate level. Mary Jo sought the educational mentorship of Dr. Stephen J. Paul, and studied with him at the University of Oklahoma where she earned her Bachelor’s Degree in Music Education. During her undergraduate studies, Mary Jo became a Christian at the age of 20 after having read the One Year Bible completely through. Upon becoming a Christian, she quickly enrolled in her local church’s MasterLife discipleship course. After a year in the church, Mary Jo and her husband, Roger, were asked to lead the youth ministry. Mary Jo and Roger have been in youth and/or music ministry for 13 years (Roger holds an M.A. from Southwestern Baptist Theological Seminary) and Mary Jo has taught band for eight years. Several years into ministry with her husband, Mary Jo began to question the basis for her belief in God. She decided that if God was real, there should be solid answers to support His existence; and solid answers are what she found. Mary Jo became interested in pursuing her research in a graduate program. She began the Master of Arts in Christian Apologetics program at Biola University in the Fall of 2005. Throughout this program, Mary Jo has become familiar with the arguments for and against the existence of God in a number of areas. She has studied with Gary Habermas, J.P. Moreland, Craig Hazen, Clay Jones, R. Douglas Geivett, John A. Bloom, Kenneth Samples, and R. Scott Smith. She has also been mentored by Dr. Paul Copan, president of the Evangelical Philosophical Society, through the Emerging Scholars Network. Her main interests are in the defense of the resurrection, the existence of absolute truth, philosophy, the problem of evil, the mystery cults, Christianity and Islam, and the writings of the early church fathers. However, she also enjoys the compatibility of science and faith, the theories on origins of the universe, and the debates concerning evolution and creation. Before MJ became a Christian, she thought religion was for the weak-minded who needed a crutch to lean on. Her main influence in this decision was the portrayal of Christianity she saw on the television in the 80’s. Coming from a loving home where she was taught to think for herself and to be accepting of all people, she did not see the need for religion or a personal savior. For MJ, God basically did not exist in her thought life. She desires to challenge all people to provide reasons for why they believe in whatever they believe. As a Christian apologist, Mary Jo is prepared to offer reasons for why she believes in the existence of God. She hopes to encourage other Christians to ask the hard questions about their faith and to find out what they really believe. In November of 2006, Mary Jo formed the website Confident Christianity with her friend, Deanna Huff. Confident Christianity is dedicated to the discussion of theology, philosophy, and apologetics. In 2007, they began the Facebook group entitled “Two Chix Apologetics,” which is one of the largest Internet-community website apologetics groups. Mary Jo enjoys conversing with people of differing views and backgrounds from all over the world who challenge her to support their beliefs.